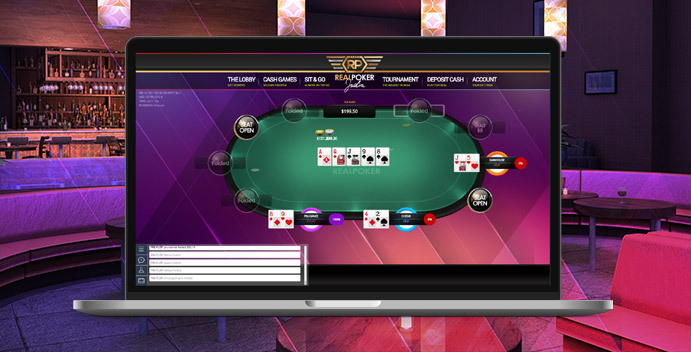 We have dozens of online and exclusive poker tournaments everyday with guaranteed pots. We take the lowest rake in Poker for India, starting at 4.15% and sliding all the way down to 2.4% for higher limit games. 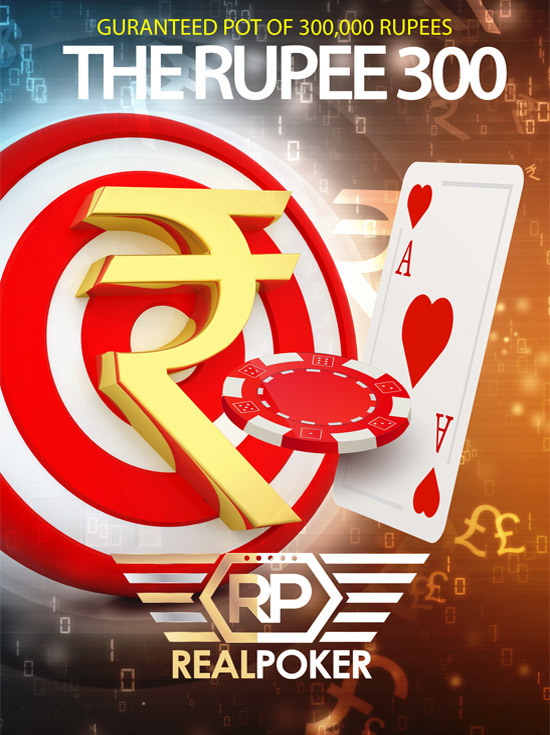 We provide the lowest rake in India, starting at 4.15% rake on your cash game hands. 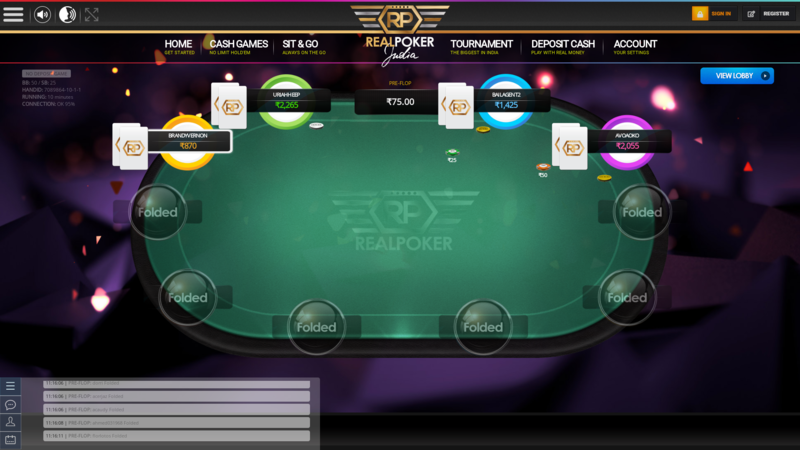 We provide 25% rake back every single day at midnight, with a real time feed of your rake back earnings as you play on our real poker India platform. Get your rake back everyday at midnight and watch your profits grow in real time with 25% back. You can find your unique referral link in your Account section, which you can use to bring others to Real Poker India and start making money from your referrals. 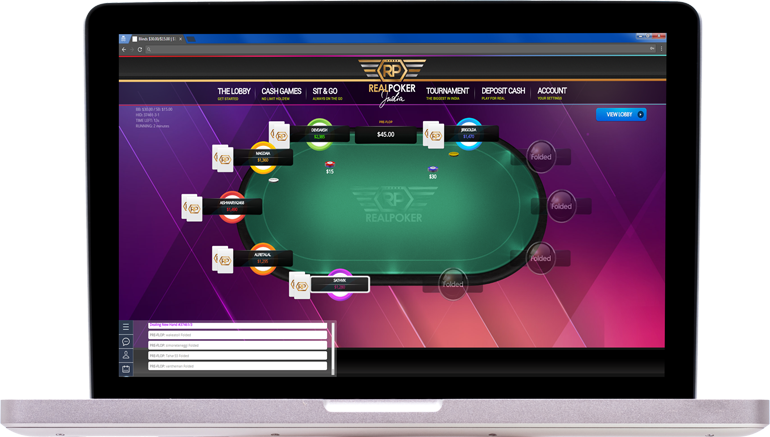 Play real poker easily in your browser on your desktop computer or via your mobile phone, the possibilites and control are limitless. 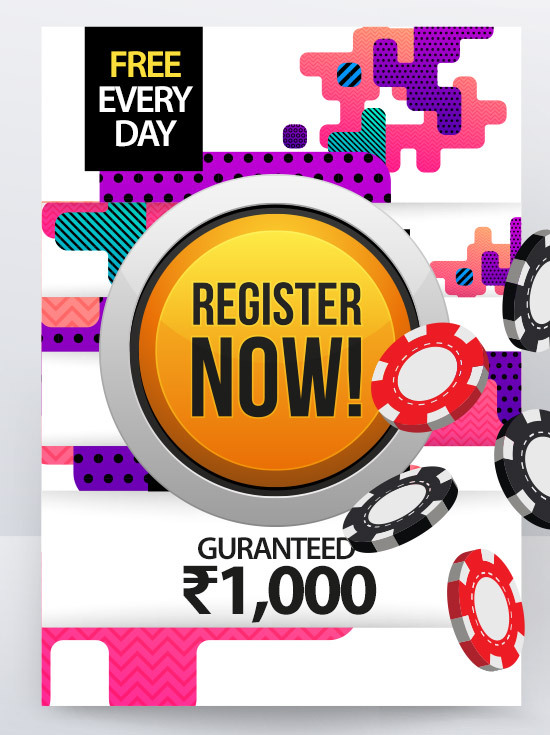 We provide our poker users with a free sign up bonus of ₹1,000 when they register and a life time 25% as a referral fee. 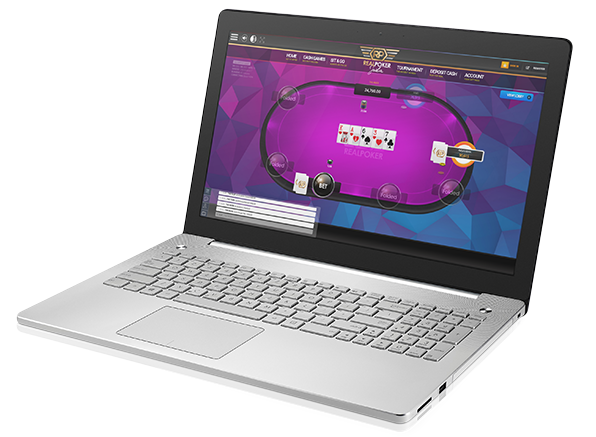 Not only can you play real poker India in your web browser but we provide software that can be played on your Windows Desktop. Join today and receive your poker bonus. 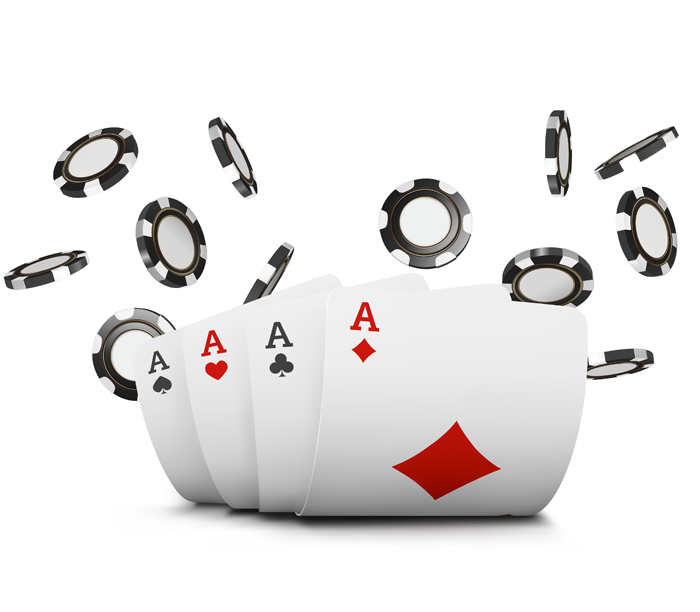 A no deposit bonus is the most popular type of bonus available at online poker sites. It means that you can claim your bonus without having to actually deposit any cash. It can also sometimes be referred to as 'Free Cash Bonus' and is mostly initiated by new poker sites to attract players like yourself to at least try their site. 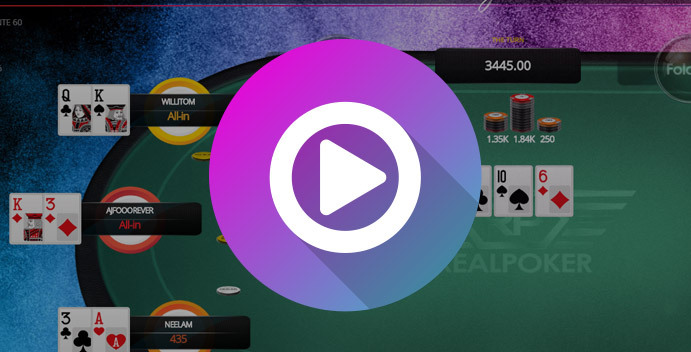 So, why should you try our real poker No Deposit Bonus? Well, what do you have to lose? 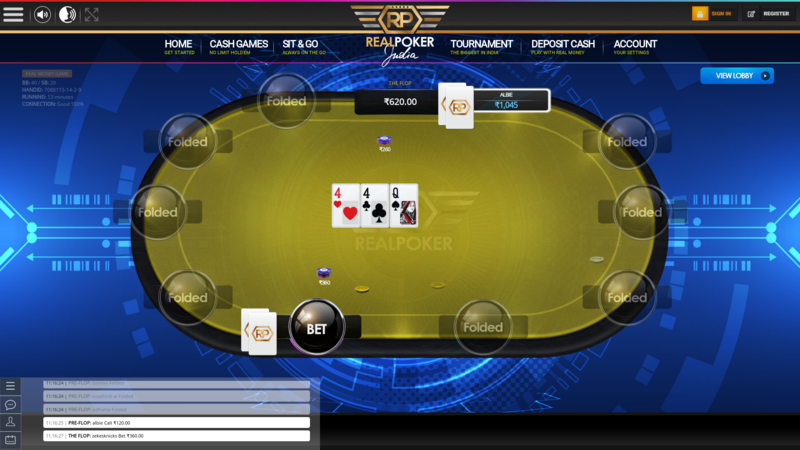 This will provide you with the opportunity to test our real poker India platform without actually having to deposit any cash with us, give us a try! 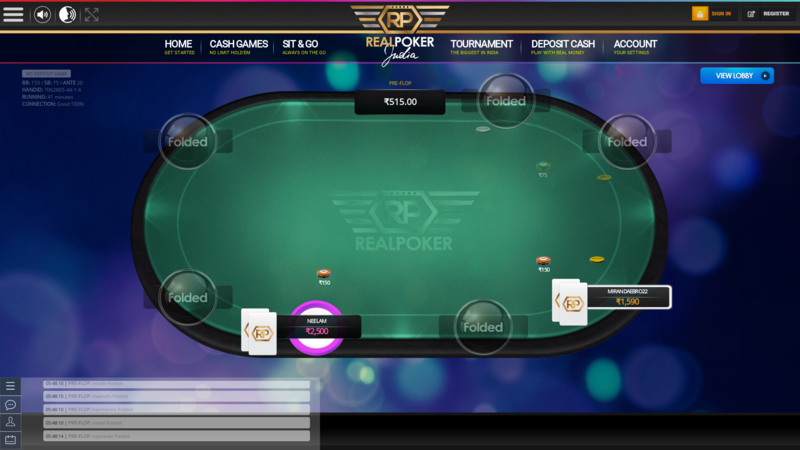 A snapshot of the current activity on real poker India, come and join the fun! One of the main things that we like to do in order to keep our players happy, is to keep offering them a number of different rewards, bonuses and promotions. This way we are giving something back to you to show you just how much you mean to us, by offering you the best rewards, promotions and bonuses around. It is not just our regular and loyal players who we have offers for either, as we also offer our new players our exciting No Deposit Bonus, which gives these new players some free money to play with online when they sign up, which will then lead to them being able to take advantage of our upcoming promotions, bonuses and rewards. The depositors daily freeroll with a guaranteed jackpot of 1,000 rupees. 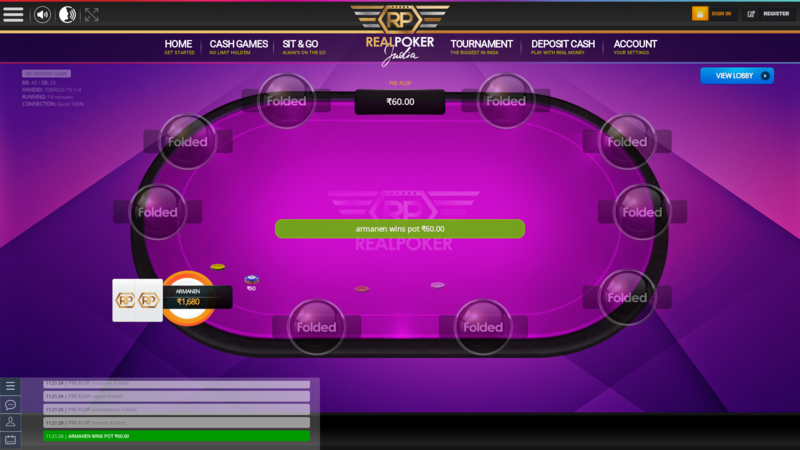 This is one of the most popular pokers on Real Poker India. The Rupee 30K tournament is twice daily event where a pot worth 30,000 is guaranteed by Real Poker. The depositors daily freeroll with a guaranteed jackpot of 5,000 rupees. 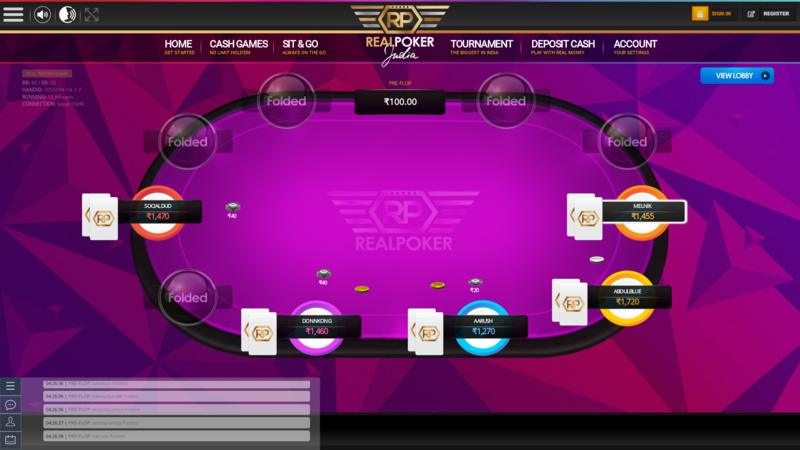 This is one of the most popular pokers on Real Poker India. 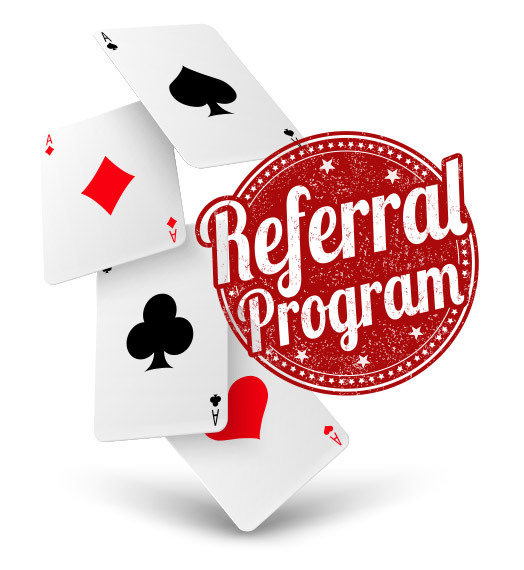 Tell a friend about Real Poker and earn 25% for LIFE on our portion of your referrals rake. 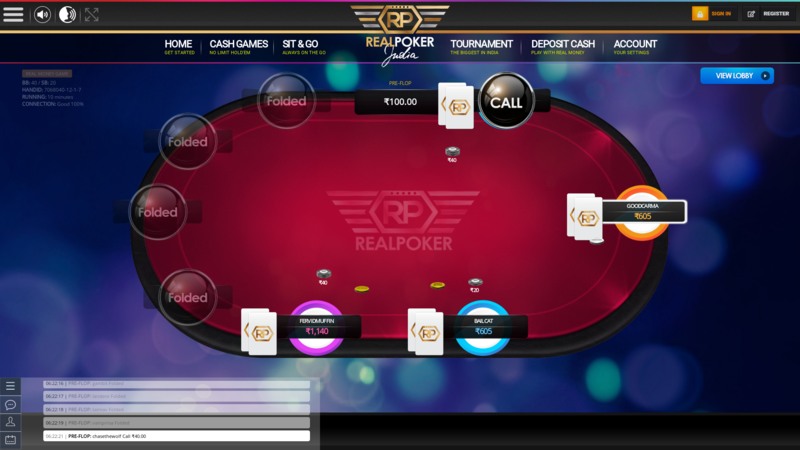 We provide an online poker real money view of what you are earning per referral 24 hours a day so you can count your referral earnings through poker with us. The more you refer the more you earn. 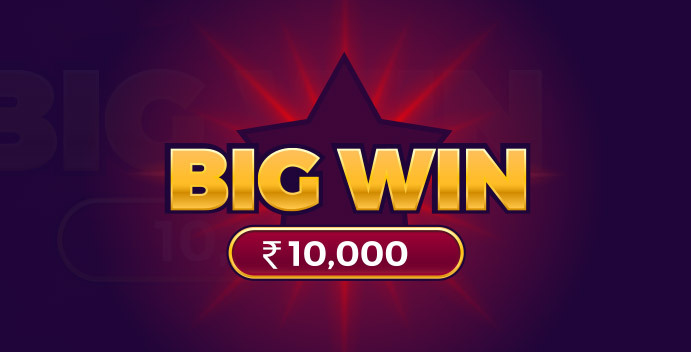 We provide free 1,000 rupee for any user who visits so that you can start earning once they have registered and start playing on the platform. You earn 1% referral rake for no deposit free users and 25% for deposited users. Poker report on the match up from Sunday between birkie, kimirina, shivansh1975, hwangjae, allind, armon, rodinamoy, kitty.litter, sunnyequity, spataro, for the prize pot of 200 rupees. Online poker match report for Ramamurthy Nagar, Bangalore from Sunday which saw remymt take the pot of 200.00 rupees on a 10 table for poker players from Ramamurthy Nagar, Bangalore. Online poker match report for Bandra Bandstand, Mumbai from Sunday which saw perisp win the prize pot of 1,250.00 rupees on a 10 table for poker players from Bandra Bandstand, Mumbai. Report on the sit and go table for CV Raman Nagar, Bangalore from Saturday 30th March which saw arantes take the winning prize money of 4,250.00 rupees on this 10 table. Report on the sit and go table this past Saturday 30th March which saw aldo-la-carne take the pot of 100.00 rupees on this 10 table. Report on the sit and go table for Rajaji Nagar, Bangalore from Saturday 30th March which saw stinkydinosaur take the pot of 150.00 rupees on this 10 table. How does Sit & Go work on Real Poker India? If you have ever been on an online poker site and you have ever spent a reasonable amount of time on there, it is probably fair to say that you have spent the most part of your time on there in the Sit & Go rooms, since these certainly seem to be the most popular type of rooms involved in online Texas Holdem poker. The reason that most people like to go and play in Sit & Go rooms is the fact that they do not usually last too long, with most of them never usually going too far beyond the one hour mark, although it obviously does vary a little bit depending on the players involved and the speed of the increases in the blinds. The Sit & Go game requires the players to all pay a set buy-in and will have a set amount of people who will be involved, and once that amount has been reached the game will begin. The blinds will start of low and will then increase at a set rate depending on the speed of the Sit & Go you have entered. Once you have lost all of your chips in a Sit & Go game, you are out and there is no option to rebuy chips and no way of getting back in the game. The winner of a game of Sit & Go is the one player who is left at the end and is holding all of the chips in the game, although there are usually cash prizes for other placed players, usually the Top 3 in a one table Sit & Go game. In case of Sit & Go, the game starts only when the required number of players are available or else, you cannot play, the total number of players determine the time it will take to finish the game. The winner is the last man standing. 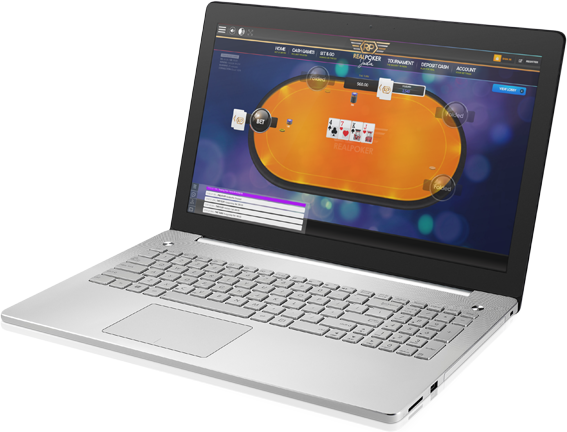 It really is a great way to play Texas Holdem Poker online. Do you have the skill to play poker in India? 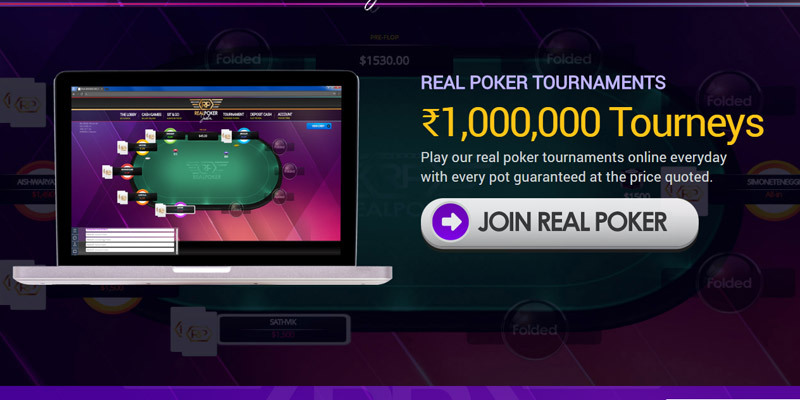 Why not try Real Poker India today and get your free ₹1,000.00 no depositers sign up bonus. How do Tournaments work on Real Poker India? There are a lot of people who love to play poker online these days and when it comes to which version of the classic card game people like to play the most, it is obvious that Texas Holdem Poker is the most popular online poker format in the world. However, there are also different ways of playing Texas Holdem Poker, with Tournament play being a very popular way for some online poker players to get their online poker fix. Texas Holdem online poker tournaments can take place with any number of tables but the set amount of players will be determined at the start of play, in order to make sure that the tournament does not last forever. All of the players involved will buy-in to the tournament for the same amount of cash and they will then be given the same amount of chips to play with. With Texas Holdem online poker tournaments in India, once you run out of the chips you have been given at the start of play, you cannot buy anymore so you are therefore out of the tournament. The winner of the tournament will be the player who is left at the end, holding all of the chips, although there are usually also prize money places given to players who finish in a certain position, which will be declared before play begins. One of the things that is used in order to make sure that the play moves along at a reasonable pace, is the fact that the blinds will continuously go up on a time limit. In a lot of tournaments you will find that the blinds are going up every 10 minutes, although this can actually vary depending on the site you are using and the type of tournament you have entered. All of the information is given to the players before the start of play though. In Tournaments, the entry is paid before the game begins, but there is no option of buying more chips if you lose. The benefit from tournaments is that, If the player is the victor, then that player has a golden chance of winning a lot of chips, which can be used for successive tournaments or cashed in for real money. It is easy to see why tournaments are so popular. What are the different types of bonuses available on RealPoker? We have a number of different bonuses, promotions and offers available here at Real Poker India, with some new ones being brought to you all the time. The best way to find out what bonuses we have on offer is to browse the website and/or check out some of the articles we have available. Can I reactivate my account once it has been deleted? No, once you delete your account it is gone for good. 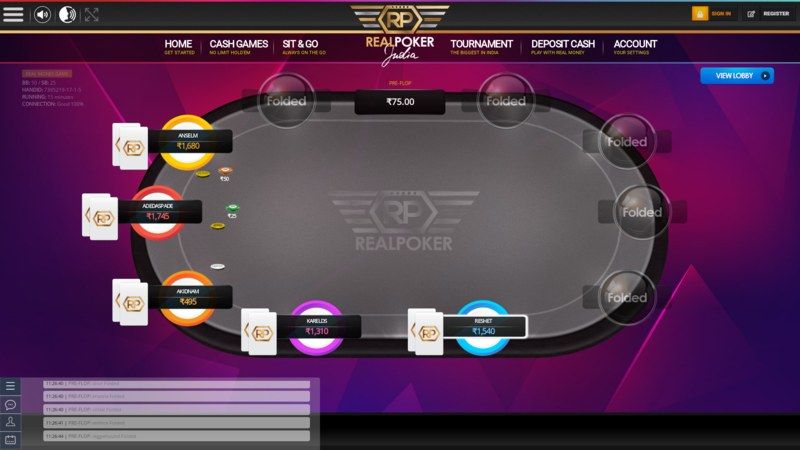 If you wish to come back to RealPoker then you will need to go through the sign-up process again. 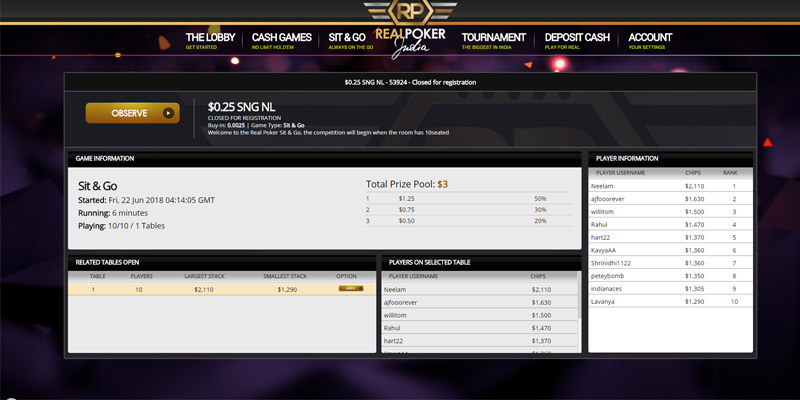 How can I register for a RealPoker tournament I wish to play in? It is very simple. All you need to do is make sure that it is still in the registering stage, or the late registration stage, then click on the tournament you wish to play in and click on register. Do make sure that you are logged in first though, as you will not be able to register otherwise. What does Rake mean in online poker? The term Rake is used to refer to the small percentage of the money that the house will take as compensation for cash games. You can withdraw all the money in your current Balance at any time. Go to My Profile page. Click on Cashout You will need to provide your Bank Account Number and IFSC Code. The details need to be filled in My account under the section Bank Details Note: PAN, Mobile Number and email verification is compulsory for all users who make a redemption request. What does Chase mean in Texas Holdem poker? What does Split Pot mean in Texas Holdem poker? 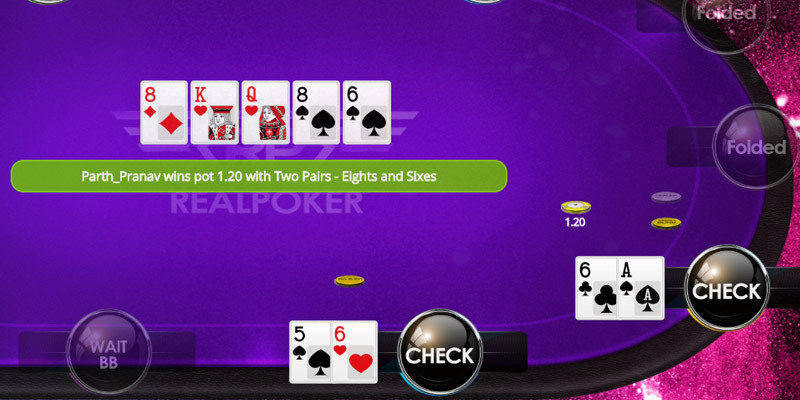 The term Split Pot is used when two or more players have the exact same hand, so have to share the chips which are in the pot, making it a Split Pot. What does Kicker mean in Texas Holdem poker? How do Cash Games work on Real Poker India? 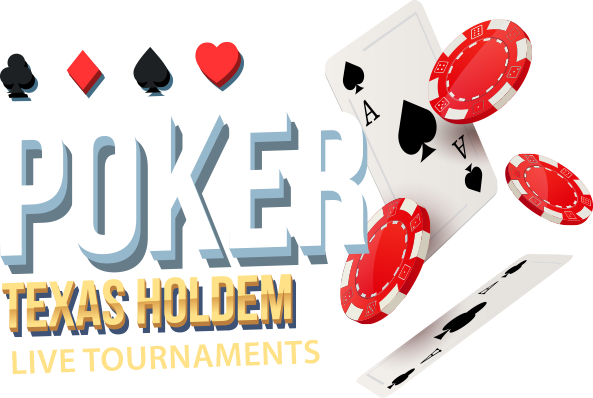 Texas Holdem Poker has become one of the most popular activities online in recent years, with millions of people all over the world heading to their favourite poker site to play a few hands and hopefully make some money. People who visit online poker sites regularly will know the difference between the different types of poker rooms which are available but the newer players might be confused, which is why we are here to help. You might have heard a lot of poker players talking about Cash Games and wondered exactly what they mean by this. Well a Cash Game in online Texas Holdem Poker is where players will exchange their hard earned cash for some poker chips in order to get started, with there often being a minimum buy-in and a maximum buy-in on the specific table. Cash games are only played on one table and players can come into the game, play a few hands and then leave as they please. 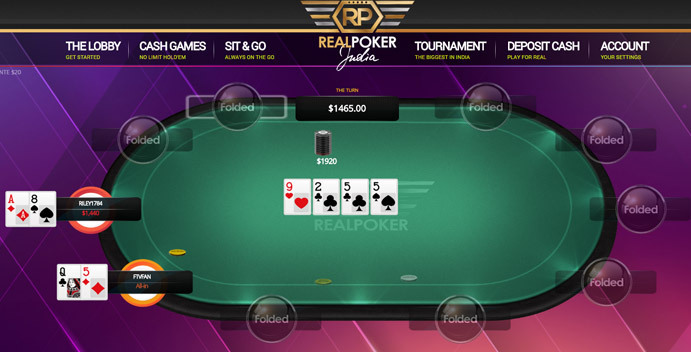 There is no official end to a Cash Game in Texas Holdem Poker online, with the game running constantly and players coming and going, cashing in their chips as they leave the table. The blinds will always remain the same in a Cash Game and you will never see the blinds going up, which will help to make your chips last longer but, if you do happen to run out of chips, it does not matter, since Cash Games also allow the players to just buy more chips and continue to play. In the Cash Games, you have to buy chips for a minimum specified amount, then you start the game. Here, the person can enter and leave the game anytime the person wants, if the player loses his chips, he/she can easily buy more chips to continue the game. It really is as simple and as great as that. India have been in the forefront of online poker for the past couple of years now. In Asia for example India have been named as one of the countries to have accepted the game as they believe it as a skill rather than an enjoyment act to pass time. 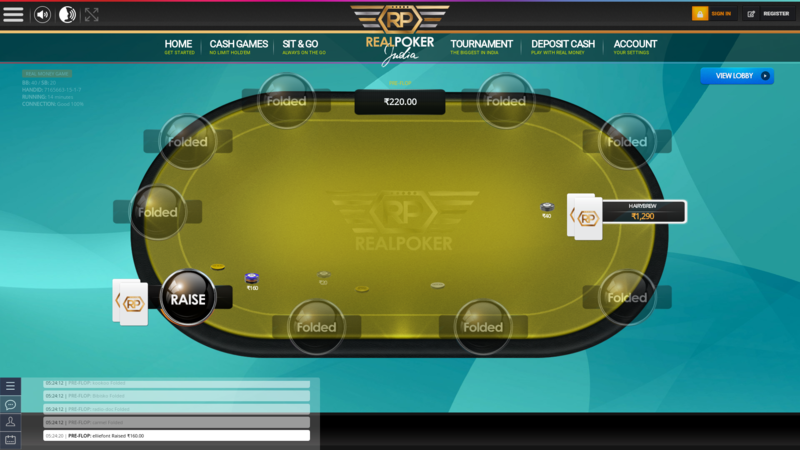 Right now more than a million Indians play online real money poker on a regular basis. This rise is due to the fact that more online poker games have increased and the notion of it as a revenue generating thing rather than enjoyment have been exemplary witnessed. Another reason as to why there is an increase of online poker is the fact that India have been in the rise of mobile phones accessibility over the past years. This has increased access to this real money online poker. The emergence of new gaming portals has also increased it demand to the players among Indians. The poker industry in this era has tried to change the notion of it as an addictive and wastage of money to rather a chance and a business. This has attracted its clients and more so, the Indian people. 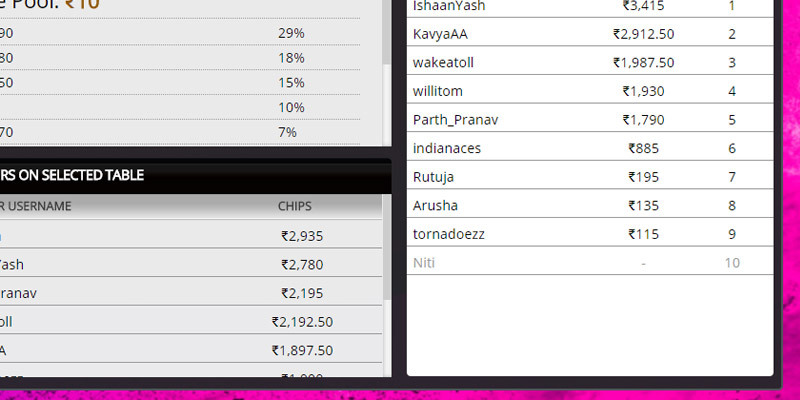 Poker in India right now is a big thing. This is due to the fact that in the past poker playing was only found in Goa, right now there are many places where it is played and it is accessible through the mobile phones and they can play even at their offices or at the comfort of their couches. Poker right now in India is being viewed as a mind game and is being promoted online via Instagram, WhatsApp, Facebook, and Twitter. Women have been exemplary pro active in these games previously dominated by men and even excelling better than their counterparts, leading to a lot of women poker players become ambassadors for online poker. Poker online is on the rise in India due to the fact that most of the population have access to internet enabled phones, tablets and computers. These gadgets were expensive and only afforded by the rich not too long ago however, things are different. This factor has positively impacted the rise of online poker in India. Another thing that is making India enjoy a rise in online poker is due to the vast mode of payment available online and security to safeguard your money and winnings.